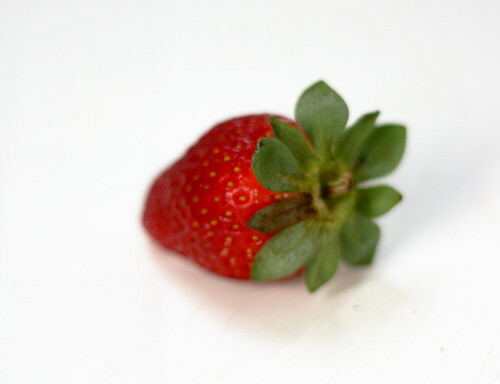 As happens every year around this time, strawberries are out in full force in my old stomping grounds, and while I've missed many things about Spring in New York (cherry blossoms and peonies and Saturday morning trips to the farmers' market), strawberry season tops the list. Strawberries are my favourite fruit. Unfortunately they're just not in season here in the Southern Hemisphere right now, and so I've settled for drooling over various bloggers' photos and recipes featuring these sweet red beauties. Yesterday though, we were out for a stroll, and we passed an enterprising young man with a cart of morangos (strawberries) for sale. They were the reddest berries I've seen in over three months and I happily shelled out $2 for a package of them. And while they weren't quite the berries of my childhood (wild strawberries picked from the woods behind our cottage in Prince Edward Island), and didn't compare to the huge flats I used to buy (and eat, in a weekend or less) in California for $6 or so, with a splash of cream and a spoonful of sugar, these strawberries took the edge off of a little bit of homesickness. I'm with you on the strawberries. Ontario in season - nothing beats 'em. Except, maybe, Ontario raspberries right off the bush, warm from the sun, exploding in your mouth! Insane. Glad you like the strawberry tart! I really like your fruit of the day posts.